Singapore -- A recent publication on Mother Teresa, often called the "Saint of the Gutters", has sent ripples of unease throughout the Catholic world and beyond. The book, called "Mother Teresa: Come Be My Light", is a collection of letters written by the famous missionary nun over a 60 year period. They show that except during her first years as a nun and for a few weeks in 1959, Mother Teresa never once felt the presence of Jesus and was continually plagued by doubt about the existence of God. It is not the first controversy has surrounded Mother Teresa. Whatever or not one accepts Hitchens' claims, this new book shows that Mother Teresa's inner life was dramatically different from her outer persona. In letter after letter to her numerous confessors she pours out her feelings of despair and abandonment. The book is difficult to read without feeling very sorry for the poor woman. But there is something else equally troubling about this book. Apparently Mother Teresa gave the strictest instructions that all her letters were to be destroyed. It seems she wanted no one to know of her inner emptiness. Her wishes have not been followed and now these most private missals are available for everyone to read. Modern Christian apologists sometimes remind me of an alcoholic. He comes home reeking of alcohol and insists to his wife that he has only had one. His friends take him aside and hint that he's drinking too much and he airily tells them that he can stop any time he wants. When his wife finds bottles of whisky hidden around the house he insists he got them to give to a friend as a birthday present. After he loses his job for continually coming to work drunk he explains to his family that he really got the sack because the boss doesn't like him. The years go by and despite all the evidence to the contrary, against the most basic common sense and in spite what everyone can plainly see, the alcoholic always has an answer, no matter how unconvincing. Likewise, in the coming years Christian theologians will be able to think of a thousand reasons why God did not reveal himself to Mother Teresa or answer her prayers, except the simplest and most obvious one - that he does not exist. Evangelical Christians who are forever insisting that 'only Jesus can give you peace' will likewise be struggling to explain why a devote, humble and self-sacrificing woman like Mother Teresa hardly had a moments peace in spite of giving her whole life to Christ and yearning for his presence. The tragedy of Mother Teresa is that she was born at a time and into a faith that considers belief in God to be the basis of all spirituality. Like Dostoevsky and so many others, she was convinced that if there is no God life must be meaningless, ethical principles must be without foundation and the universe must be unexplainable. According to her letters, Mother Teresa's faith in God started to wane soon after she moved to Calcutta to found the Home for the Destitute Dying in 1948. To a Buddhist this would hardly be surprising. Seeing beggars with maggots in their wounds and being eaten alive by rats, as Mother Teresa did, would have to shake any intelligent person's faith in a loving caring deity. 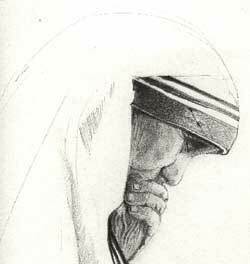 Throughout the following years Mother Teresa wrote of her doubts and feelings of abandonment by God to her various confessors and they urged her to be patient and to pray harder. Sometimes her confessors' advice and encouragement kept the darkness at bay for a while but it always came back. Imagine if the Buddha had been her confessor. When she told him that she had doubts in the existence of God he would have smiled at her and said; 'It is good to be uncertain, it is good to doubt. Uncertainty arises towards something that is doubtful' (Kankhàniye va pana vo thàne vicikicchà uppannà, Anguttara Nikaya,I,189). Given her conditioning this statement would have shocked her. She might have asked: 'But Lord, if there is no God there must be no immortal soul and therefore no salvation!' The Buddha would have replied; 'When someone thinks "Alas, I had it and now I have it no longer" they grieve, lament, beat their breast and feel sorrow. This is how there comes to be agitation about something that does not exist' (Majjhima Nikaya,I,136). Then he would have explained to her the truth of anatta. He might have then told her about kamma so she could see that ethics can still be meaningful without having to believe in a divine being who keeps everyone in line with rewards and punishment. He would have taught her the Noble Eightfold Path so she could understand that life can have direction and purpose despite there being no Jesus. He would have also reassured her that doubt was not necessarily a sign of rebelliousness and sinfulness but sometimes of intelligence. And finally, he would have shown her how to meditate so that she could develop a deep inner stillness and peace that was due to seeing things as they are rather than being based on believing in things that are not. Had she been able to grasp all this, Mother Teresa would have still then been able to do all the good she did and have inner peace as well. In the light of all these recent revelations it seems likely that Mother Teresa's hectic activity, her punishing routine and her demanding personality were all an attempt to escape from her agonizing doubt. The constant self-abasement that is to be found in nearly every one of her letters probably has the same origin. None of this detracts from Mother Teresa's uniqueness. Her dedication to the poor makes her a saint by any standards, at least a saint as the word is used in the non-religious sense. But it does cast yet more serious doubts on the existence of God. Mother Teresa could have done everything she did without believing in God and now we know that actually she did do it without believing in God - or at least while having persistent doubts about his existence. In fact, it was only her conviction that she should believe in God when she could not, that made her life so unhappy.